I have a couple thousand e-mails in my Gmail inbox which I want to move to a folder called "oldmail". I can select the checkbox button and then "All" and move but it only selects and moves those that are showing (about 40). How can I select and move all mails from my inbox to the folder "oldmail"? You should then see "All 100 conversations on this page are selected. 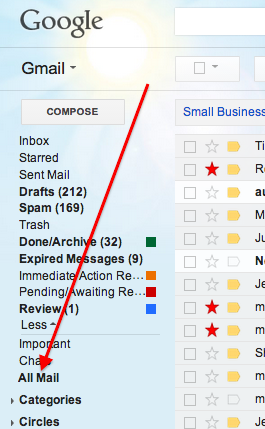 Select all 139 conversations in Inbox" between the buttons and the first email. Click the second part of the phrase. I was able to do this using filters. Apply filter to [thousands of] matching conversations. As of the time of writing, following mhoran_psprep's answer will not do because Gmail will no longer prompt you for the option of selecting all your mail. The good news is, you can still work around it. The key is to use a custom search string such as in:inbox is:read which then brings up the prompt again. You can modify it for your needs to catch more than just read mails. I found this solution on wikiHow. 1. In the menu on the lefthand side (beneath "Inbox, Starred" etc), click "More"
3. Check the master selection box above the top ad, above your inbox. 4. Beneath the ad, you'll see a message with something like "All ### conversations on this page are selected. Select all ### conversations in Inbox". Click the second part of the phrase. 5. 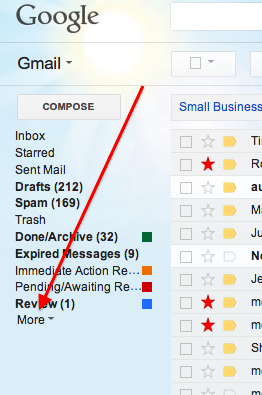 Archive your emails by clicking the Archive button. As of Jan 2014 I think this is even more broken that it was a few months ago. No matter which search criteria I used, I could not get Google to return more than about 45 messages on my wife's account. There's no UI indication that the search results are incomplete. Then I clicked the select all box - only 45 were returned and they were all checked, but I still checked Select All. THEN I could the subtle (old school) link to "Select all messages that match this search". Again, there's no UI indication, but when I clicked that I say "Loading ..." for a minute or two. Then the messages were archived. How do I move a search-filtered set of emails into another folder? How do you undo a POP transfer of all mails from one Gmail account to another? 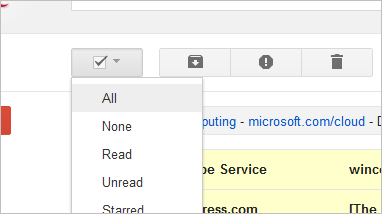 How do I 'move to folder' in Gmail search results? How do I efficiently move a searched set of Gmail conversations into another label? Removed labels - where did my emails go?